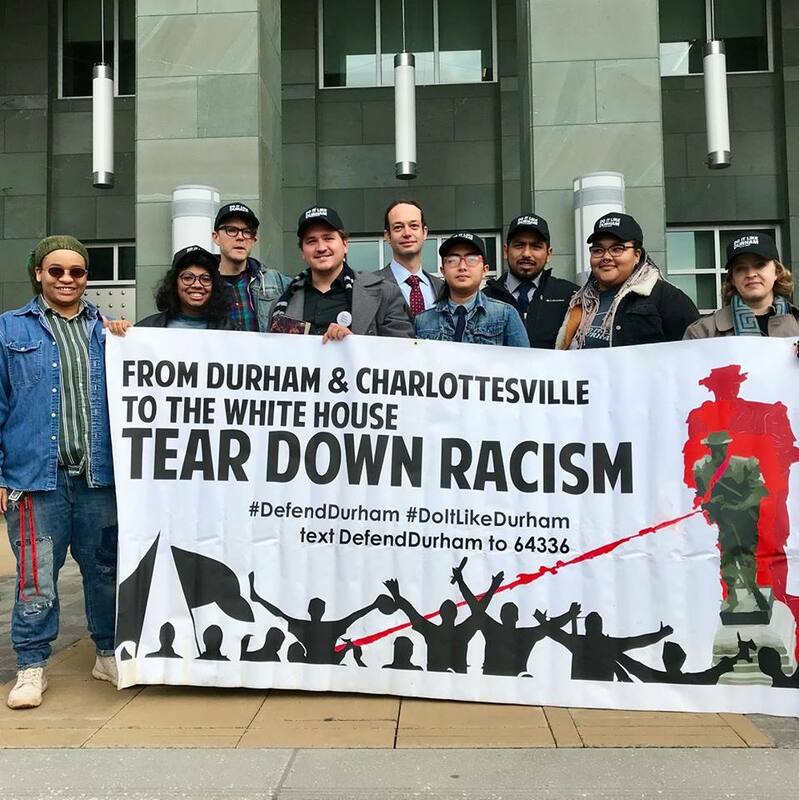 On February 20, Durham District Attorney Roger Echols announced that all charges had been dropped against the eight anti-racist freedom fighters stemming from the righteous people’s toppling of the Confederate monument in Durham, N.C., on Aug. 14. This includes not only the five who were to return to court on April 2 – Takiyah Thompson, Elena Everett, Jess Jude, Q Wideman, and Joe Karlik – but additionally overturns Loan Tran’s earlier plea. On February 19, Raul Jimenez was found not guilty on all charges, and the cases against Dante Strobino and Peter Gilbert were dismissed. Shame on Durham County Sheriff Mike Andrews, who unleashed a witch-hunt against anti-racist activists in the days and weeks following the toppling, who has defended the lethal conditions in the Durham county jail despite the countless jail deaths that have occured on his watch, and other political officials who were content to issue statements but did nothing to stop the charges from moving forward or to resist white supremacy in action here in our city and state, allowing gentrification to amplify the eviction crisis, the state of police and ICE terror, and racial injustice here in Durham. How many tens of thousands of dollars were wasted by the city in pursuit of these frivolous charges that could have been put towards people’s needs in our community? Power to the people! Fighting white supremacy is not a crime! The Aug. 14 action liberated our community from a symbol of terror. Erected in 1924 at the height of Ku Klux Klan membership and strength, the monument, which stood outside the old Durham County Courthouse, was a reminder to Black and Brown people that although the physical chains of slavery may be no more, there would never be justice under this white supremacist system. Members of the Durham community had traveled to Charlottesville on Aug. 12 and defended themselves there against the violence of the fascists. Upon returning to Durham, we decided to make a bold response to the outright terror inflicted there, terror committed in an attempt to threaten into silence the voices of people of color and their anti-racist allies. Tearing down the Confederate statue not only strengthened the national movement against white supremacy at a critical time, but made clear that the racist practices of Durham’s government officials and institutions — including the cops, courts and jails — would not be tolerated. We express continued solidarity with Chris Brazil, who still faces charges stemming from the anti-Klan uprising in Durham on Aug. 18. We encourage supporters to continue pressuring the DA’s office until every last charge is dropped. We know that this victory is a step in the struggle against white supremacy, and that the struggle is long and continues. It will continue as long as people are locked up in the Durham County jails, suffering from horrific conditions there. It will continue as long as our communities are being destroyed by gentrification, and our immigrant community members are subjected to raids and deportations. It will continue until every monument to racist oppression is taken down. One day soon, we will tear down things bigger than statues, and build a world based on justice and liberation. We say: Do it like Durham! Topple racism and white supremacy!